When the last of the leaves are raked and composted, and the flower beds are tidied and mulched for the winter, most gardeners retreat to the warmth of their favorite chair and surround themselves with garden catalogs and stare out the window to fantasize about the upcoming spring projects. But, we need to get outside in our gardens – even on cold, winter days because, if not, we are missing one of the most peaceful, serene seasons in our gardens – the winter landscape. 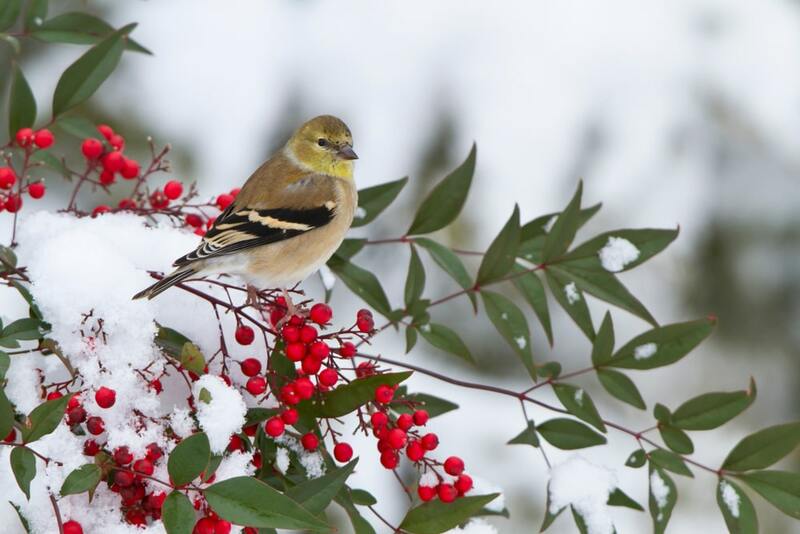 With proper planning and planting, incorporating plant material which offers winter interest in the garden can extend our gardening enjoyment into a year-round activity. As I said in the beginning, our landscape in winter is much different than any other time of year. Shrubs and trees with no leaves expose their texture and form. This winter texture becomes the dominant features in our garden. When we do have snow like we had in early December and again last week, our evergreen shrubs and trees suddenly stand out against the white background that the snowfall has created. As I write this blog I realize that I tend to take more pictures of my gardens covered in snow than I do any other time of the year. I love the look of the tree limbs and the evergreens covered in snow. We have a wide variety of planting material available to us in our hardiness zone 7 that is not only excellent for our spring, summer and fall gardens but can also offer us the added dimension of winter interest. Azaleas – a popular plant that has winter interest with their leaves becoming red or maroon this time of year. You need to consider the Encore azaleas. These beauties bloom not only in the spring but again in the fall. Nandina – there are so many popular varieties. Nandina domestica “Heavenly Bamboo” is the tall variety with large clusters of red berries dangling down off the branches. Another popular nandina is Fire Power. Fire Power has fiery red leaves on a mounding off the ground about two feet. Mahonia bealei – is in bloom right now with its yellow flowers. Commonly referred to as “Oregon Grape Holly” this shade-loving evergreen offers great winter interest. Rhododendrons – they have their flower buds already formed and sitting on the tips of the branches just ready to start blooming come early spring. Magnolia – there are so many wonderful varieties such as Brackens Brown Beauty and Little Gem. All have glossy leaves. Hollies – there are so many beautiful hollies with all kinds of growing dimensions. Great evergreens to use as foundation plants to accent plants or to use for screening. Loropetalum – this plant came onto the market in our growing zone about twenty years ago and has proven to be worthy. It has reddish-purple leaves and pink flowers. Many different varieties with different growing habits. Cornus florida – our dogwood tree. Our state tree. Great small tree to use for spring color. Corylus ‘Contorta’ – “Harry Lauter’s Walking Stick” With its twisted stems and branches, I like this plant more this time of year than any other time of year. Lagerstromia indica – our Crape Myrtle trees. Some varieties, such as Natchez and Muskogee, have attractive exfoliating bark that has winter interest. Acer – many of our Japanese Maple trees such as the dissectum varieties that give a beautiful weeping growing habit in the landscape. And, the ‘Coral Bark’ Japanese maple tree is a standout in the winter with its bright coral colored trunk and branching. I could go on and on listing plants that provide winter interest. This short listing is only meant to be a starting point in stressing how we have so many plants that we can use to give us winter interest in our landscape. For gardeners hoping to develop more winter interest in their gardens, it would be an excellent idea to bundle up one day this winter and take a walk through the grounds at Lewis Ginter Botanical Gardens or at Maymont and observe their plantings. These gardens are wonderful resources and excellent sources of ideas.